Best wishes on Ganesha Chaturthi to all believers and fans. We have to admit, we do think of Ganesha as a cutie pie. Also he is mama's golden boy and you know that no one crosses his mom and lives to tell about it (ask the demon Mahisha-Asura). BTW if you are curious to know how left-liberals think about Ganesha just follow Ram Gopal Varma on Twitter. RGV is originally from Vijayawada, Andhra Pradesh and he is a super-hit director in both the Hindi and Telugu film world. His top movie is Satya (we also rate Rangeela), which Danny Boyle has claimed as an inspiration for Slumdog Millionaire (that must be a first...a western director...for real or for show....claims to being inspired by Bollywood). In an ideal world, we would be most happy if the liberals established a hegemony in which we could crack jokes (even mean jokes) about religion and the religious...all of them. The sheer number of ridiculous religious leaders in India (and in the wider world) presents endless opportunities for (black) comedy. But we would propose to do it in a fair-minded and even-handed manner, or we are in danger of looking ridiculous ourselves. RGV we are sure, thinks twice about breaching some boundaries than others. Why is that? Now, we should be clear that RGV is entitled to his views and opinions, but we fail to see what good comes out of this tamasha. From a political standpoint he is acting like a recruiting agent for the BJP. Poking the crocodile is a lot of fun...sure, but then why crawl back with the apologies? Be a big boy and dish it out and be prepared to accept the consequences...in the extreme case be prepared to go to jail and start a new life-edition as a free speech martyr (we fully support him in that battle). RGV considers himself as a man on a mission...to remove the cobwebs of superstition from the minds of deluded people. This is a fine and honest goal. Thomas Jefferson was also a man on a mission and he said that the tree of liberty must be refreshed from time to time with the blood of patriots and tyrants. RGV should have boldly stood up for (all) free speech and the free-flowing blood would have helped the tiny sapling to grow into a massive banyan tree. We did like some of the non-inflamed responses, especially the one by "Subodh" who made a sporting attempt to respond to Shri RGV (questions marked below in bold and in red). It is painful to see that those who take pride in Hindu religion couldn't answer any of his questions and instead childishly chided him for insulting Hindu gods. If you can't answer legitimate questions about the gods that you worship, you should stop being so religious. His questions were hardly that difficult to answer..With a little bit of wit and wisdom, anyone could have answered them, but sadly the IQ levels of 'bhakts' and also their knowledge about their religion is very low. Here's how you need to respond to silly questions..
Q- What did Ganesha do that his brother Kumara dint do so that only Ganesha became god? Is it becos Kumara dint get head cut off like Ganesha? A - He was cuter, wiser, wittier and hence gathered more followers. Like in movie industry where more the fans you have, the bigger screen god you become, in heavens too children of gods who gather more followers become bigger gods. 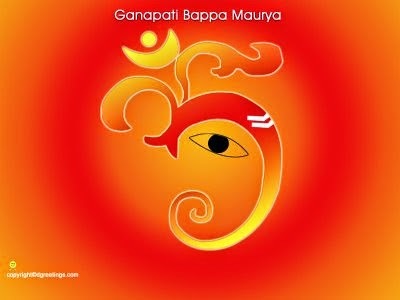 Q - Can someone tell me if today is the day Ganesha was originally born or is it the day his dad cut his head off? A - Today's the day we don't ask silly questions about gods we worship and use our brains to understand the symbolism behind mythological tales of gods. Q - Does Lord Ganesha eat with his hands or his trunk? Q - I have an innocent question...can someone please tell me how a Lord who couldn't save his own head will save others heads? A - A local wrestler might not be able to win against a national or Olympic level wrestler but he can save you from a local goon. Same way, Ganesha couldn't save his head from a more powerful god - his father, but is capable of saving heads of mere mortals. Q - Did Lord Ganesha have a paunch in his childhood too or did it develop in the recovery time of the elephant head operation? Q - Can someone explain how someone can cut off a child's head who was just trying to protect his mother's modesty? No religion has a god as child-friendly as Lord Ganesha. Animal heads on divine beings is not quite unknown in other religions. The Egyptians had several but let's face it when it comes to terms of endearment, jackals and falcons just cannot compare to an elephant. It was a particular elephant's bad luck but Hinduism's good fortune, that when Lord Shiva went looking for a head to replace the human one he had lopped off, he came across an elephant, some say Indra's mount Airavata and not an annoying crow or a fearsome tiger. That would have given our Ganesha a very different temperament. But with his elephant head, Ganesha becomes the most genial of all gods especially for a young child. The broken tusk makes him vulnerable. The plump belly makes him comforting. He is virtuous as gods are supposed to be but exudes a more approachable friendliness. Though Hindu children routinely and religiously pray to Saraswati for a little help during examinations, no one would make a children's film called My Friend Saraswati. But it makes perfect sense for a lonely boy neglected by his parents to find a buddy and fairy godfather rolled into one in the elephant-headed god in My Friend Ganesha. Ganesha isn't just friendly. He also has a certain kind of smart that a kid can instantly relate to. Take that story of Ganesha and Kartikeya and their great race to circumnavigate the world. While Kartikeya huffed and puffed and set off at great speed to go around the world, Ganesha just sat his parents down and went around them. It was so incredible to read it on the colorful pages of Amar Chitra Katha and know that the handsome, super-athletic school jock didn't always have to win the race. As a child there were things that mystified me about Ganesh. How did someone of his girth ride a mouse? Why did an elephant's head make the rest of him so roly-poly? 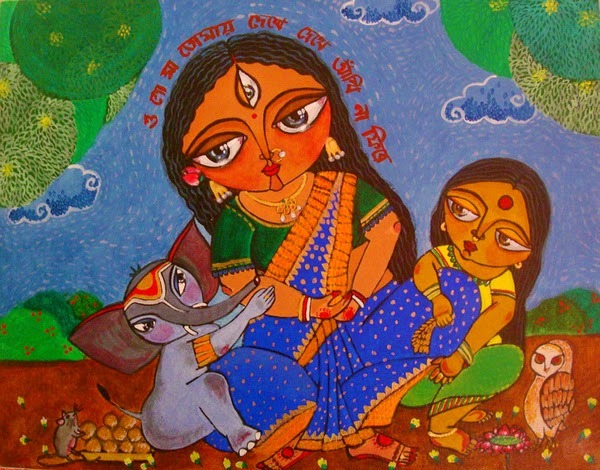 In the Bengali iconography during Durga Puja he came with a kola-bou, a banana tree draped in a white sari with a red border. Though scholars have argued whether the kola-bou was his bride or a representation of the Mother Goddess herself, as a child I was always worried the elephant-headed god might snack on his banana-plant bride in an incautious moment. Amar Chitra Katha had no answers to these conundrums and Devdutt Pattanaik had not yet written his 99 Thoughts on Ganesha. The story of his creation itself, I discovered later, had been sanitized and tempered. Parvati creates Ganesha as her little gatekeeper out of the rubbings of turmeric paste she has anointed herself with. He is Vinayaka, the son born without the help of a husband. When Shiva lops his head off for the effrontery of denying him entrance, Parvati is inconsolable. Firstpost's Lakshmi Chaudhry recalled her daughter coming back from school and telling her a more “family-friendly” version of that story. “Parvati felt so sad when Shiva killed her little boy, she started crying,” she said, explaining how Shiva replaced his head to soothe his distraught wife. This was definitely not my grandmother's Ganesha story. My daughter's very progressive pre-school had sanitised the myth to fit the portrait of a happy modern nuclear family. Don't worry, good daddies comfort sad mommies, and make it all okay. “No, baby, Parvati was so angry that she vowed to destroy the entire universe,” I corrected her, “The gods were so terrified that they ran to Shiva and begged him to bring the boy back to life.” The Parvati I grew up with was not a heart-broken waif, but powerful and feared goddess whose wrath had to be appeased in order to save all creation. That says more about our discomfort with powerful females than anything about Ganesha. But the sweetness of the teary Parvati also makes it a better bedtime story and gives Ganesha an extra dose of cuddliness. Ironically the very qualities that have made him both beloved and lovable have also been his greatest handicap. In Hinduism he might be the Remover of Obstacles but outside the faith he has become more cute and less god. In a world of animated films where animals routinely talk in human voices, Ganesha, to much of the world, belongs to a different pantheon - more Disney than God. But unlike a Disney character he is in the public domain - free to be emblazoned on t-shirts, keychains, lunchboxes. And unfortunately he also ends up on things he should never be. American Eagle put him on slippers. Sittin' Pretty put him on toilet seats. Café Press put Ganesha and other gods on thongs and $79 yoga mats. Bollywood-themed parties in the West put up statues of Ganesha and Buddha for that exotic touch while belly-dancers gyrate and the bartender mixes cocktails. A party organizer in San Francisco once said she would try and educate her clients about the significance of religious symbols and put up signage explaining them but she was not sure that anyone cared after the "third shot of tequila". Were the companies intending to disrespect Hinduism? Probably not. Ganesh to them was just a cool iconic image. But the danger of cool is then even a God becomes a commodity to be bought and sold. The god who removes obstacles seems helpless when the juggernaut of popular culture turns him into a potbellied party prop. Pattanaik says reassuringly that though he's been turned into celluloid cartoons and plastic China-made dashboard displays, “Ganesha does not mind, so long as we appreciate the realm of his mother, and aspire for the realm of his father.” Perhaps that's true. But still one should think long and hard before annoying any god especially one with the memory of an elephant.